Marcus Aurelio (Lelo), Mestrando Barraozinho was born in the city of Recife in the northeast of Brazil. He began training Capoeira at the age of three with his father Mestre Barrão, whom he accompanied to his classes, Capoeira events and street rodas. Mestrando Barraozinho’s passion for Capoeira has lead him to focus on nothing but his studies and his training. At the age of nine he moved to Canada with his parents where he continued to train and also began to perform in many shows, school demonstrations, and festivals in British Columbia Canada and abroad. Also, at that young age he had his first experience in a recording studio where he sang a track on the CD Axé Capoeira Vol. II. Since then he has had many achievements and successes, sung chorus and played instruments on all of Mestre Barrão’s subsequent albums and even sang another track on the most recent Vol. VI. He has performed on various films, T.V. shows and commercials, commission motion capture for popular video games and helped his father to make an instructional video series for Panther Productions. In the year 2000 Mestrando Barraozinho won second place out of two hundred and fifty participants in the International Capoeira Competition in Brazil, as well as winning the recent Axé Capoeira International Competition in 2005. In the same year Barrãozinho competed in several mixed martial arts competitions where he placed very highly with his new 20 second knockout video. Over the past few years he has accompanied his father to events and encounters in various countries such as Canada, U.S.A, Poland, Russia, Turkey, France, Spain, Greece, Mexico, Trinidad & Tobago, Virgin Islands, Brazil and many other locations around North America. 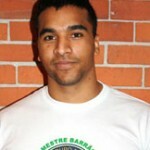 Today he is the owner and manager of one of Axé Capoeira’s Academies in Vancouver, Canada. His style and creativity in the game is motivational to many and has made him one of today’s most influential young capoeira players.